Joshua Crough, GIS Analyst with fRI Research, had to solve a problem. And despite the ever-expanding set of tools that come with GIS software, there wasn’t an out-of-the-box solution. The Caribou Program was assessing how often people drive Off Highway Vehicles like snowmobiles and ATVs on seismic lines in two caribou herd ranges. This information is useful for knowing which seismic lines should be restored to help conserve caribou. One of their hypotheses was that there would be more use on a seismic line if it was closer to a town. It was Josh’s job to give the researchers a user-friendly tool that measures how accessible the seismic lines are. Josh’s solution was to write a computer program that performs a raster-based analysis to calculate the travel distance between the start of a seismic line (where it connects to a road) and the nearest town. Using travel distance along roads is more useful than measuring a straight line between the seismic line and a town, which can significantly underestimate the real distance people would have to travel to get there. 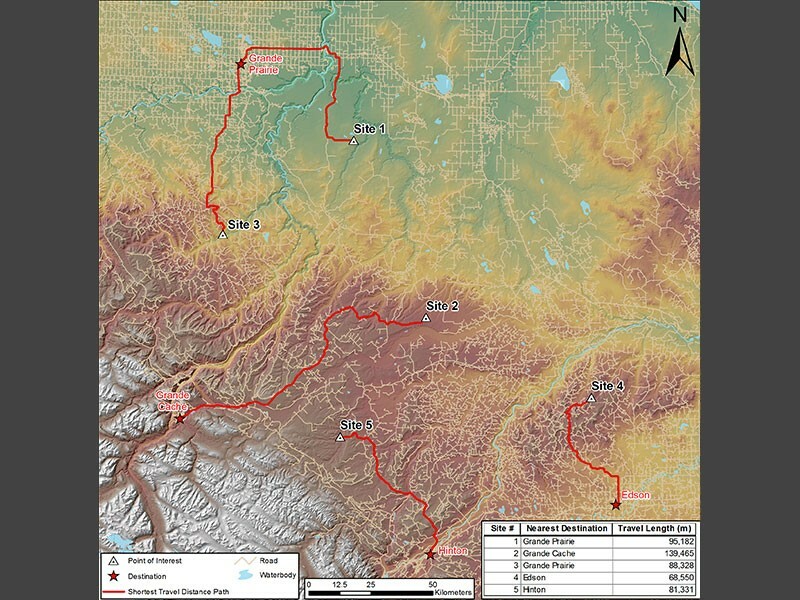 The Caribou Program researchers used the tool to measure the travel distances to the seismic lines, in order to determine exactly how accessible the seismic lines are. They then compared that with how often OHVs were used on the lines. The results were published in a paper in Environmental Management. Thanks to Josh’s tool, the researchers were able to rule out travel distance to seismic lines as a significant factor for use, instead finding that ease of travel on the line (less vegetation in the way) was the best predictor of use. This finding will help government and industry prioritize which seismic lines to restore to get the greatest benefit for caribou. The tool is likely to be useful in many other situations, as it can be easily adapted to work in different areas and for other kinds of features besides seismic lines. If you’re interested in the tool, contact GIS Program lead Julie Duval.